It would be unfair to dismiss Dubai as just a desert country. With its excellent infrastructure and decidedly western view, Dubai has become one of the biggest holiday destinations in world. One of seven emirates that make up the United Arab Emirates, many treat Dubai like it is a completely different country. From gorgeous beaches to lush green golf courses, from high end shopping malls to indoor skiing, Dubai has plenty to offer tourists. The Al Badia Golf Club is an eighteen hole course located in Dubai. The course is a heavenly island of water and greenery. Designed by Robert Trent Jones II, the highly acclaimed golf architect, the course stays true to its oasis theme with eleven lakes, as well as several streams and a number of gently cascading waterfalls. The golf course exclusively features plants that are only found in the Arabian Gulf. The overall aesthetics of the grounds are complemented by the ‘rivers of sand’ concept which provides a visually sharp playing area. The course is easy enough to entice novices but at the same time is challenging enough to attract seasoned golfers. Golf pros can opt to play the full 7,703 yards, while beginners can scale it down to a shorter 5,398 yards. The Al Badia Golf Club also has a floodlit driving range, and a well-stocked golf store. Visitors can also practise their skills at the TaylorMade Performance Lab, which uses state of the art equipment to help golfers improve their skills. After a long, relaxing game on the green, golfers can end the day with a drink or a delightful meal at one of the club’s several dining venues. Visitors looking for total relaxation can try the club’s spa, which features steam rooms and a sauna. 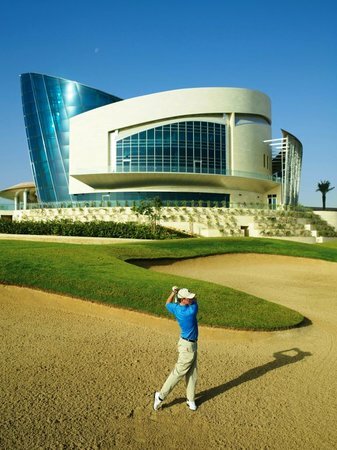 The golf club is just one component of the Dubai Festival City. Fees for the use of the course vary, with weekends being more expensive. Those interested in visiting here can get more information at the golf club’s website. Tourists visiting the UAE and looking for a Dubai city hotel can try the Grand Millennium Dubai. The Dubai luxury hotel is cosily located among the best shopping and leisure hubs in the city.